This is a very exciting post – big development on the senior design. It was technically accomplished shortly after the last post, but it’s been an (even) busier time lately. On Oct 25 I participated in IEEEXtreme, a 24 HOUR programming competition. Keep in mind that I do not consider programming my main trade. Despite that, my team and I ranked 11th in the US 😀 And last weekend, I was flown out of state for an interview, so I spent the week leading up to it doing interview prep. Cool right? So how do we do it? I present the picture below. (Nevermind my expression, I may not have been all there…) As per the last post, when we got the 3D coordinates of joints out of the Kinect program, we immediately got to work on this. The basic idea is that given points, you can extend vectors between them. Then the angles between vectors A and B satisfy cos(theta) = (A dot B)/(|A||B|). It remains then to find reference vectors for our angles, which is what the picture shows above. Now, the elbow is eeeeaaasssyy, since it only bends one way. But your shoulder is more complicated. Our system is situated so that one degree of freedom of movement allows your outreached arm to sweep in front of you, and the other degree of freedom sweeps vertically normal to your outstretched arm. Neither directly provides a clear reference directions. Currently, one angle is provided by placing a vector through my head (figuratively), and the other along my upper arm. The other angle is provided by placing a vector traversing my shoulderblades, and the other also through my upper arm, BUT THEN PROJECTED onto the horizontal plane containing my shoulders. 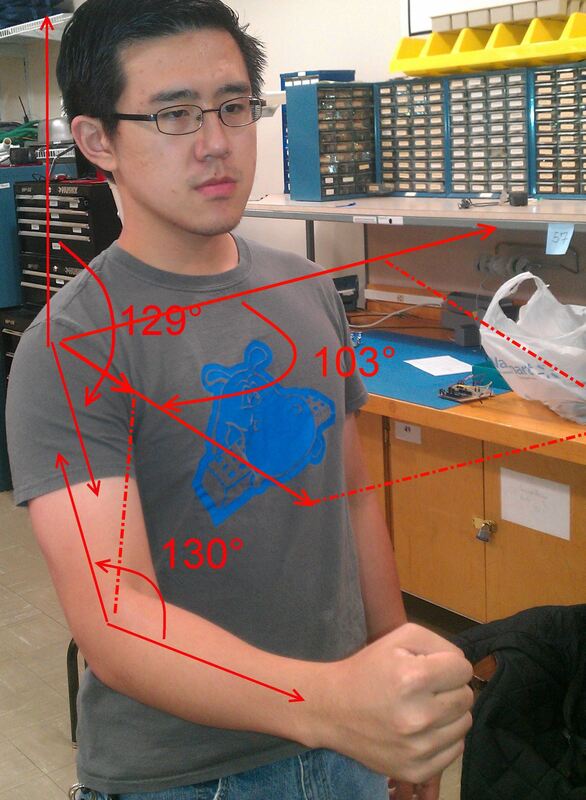 It’s not a terribly elegant solution, since the projection becomes smaller the lower the arm generally becomes. I’m considering teaching myself a kinematics crash course to see if anything can help us on our project. This entry was posted in Robot Arm with Kinect Interface. Bookmark the permalink.